ISLAMABAD: The Pakistan Muslim League-Nawaz (PML-N) has formed a panel to develop a roadmap for the party’s reorganisation. The 18-member central organising committee will be headed by acting secretary general of the party and former interior minister Ahsan Iqbal. According to a notification issued with the signature of PML-N president Shahbaz Sharif, the mandate of the committee would be to review organisational structure and capabilities of the party, make commendations for strengthening organisational capabilities and its effectiveness and recommend a plan of action for the party’s mobilisation at grass-roots level. Members of the committee are: Hamza Shahbaz, Khawaja Saad Rafique, Khawaja Asif, Rana Sanaullah, Ameer Muqam, retired Lt Gen Abdul Qadir, Sardar Owais Leghari, Nuzhat Sadiq, Raheela Durrani, Murtaza Javed Abbasi, Asad Junejo, Rana Tanvir Hussain, Abdul Khaliq Wasi (AJK), Ghalib Khan (Fata), Shah Muhammad Shah and Attaullah Tarar. Talking to Dawn, PML-N spokesperson Marriyum Aurangzeb said the existing structure of the party would remain unchanged. She said the committee had been formed to propose a strategy to reorganise the party at grass-roots level across the country. Meanwhile, the PML-N has decided to release a ‘fact sheet’ about the PTI government’s performance in its first 100 days to apprise the people in detail of ‘failures’ of the government. 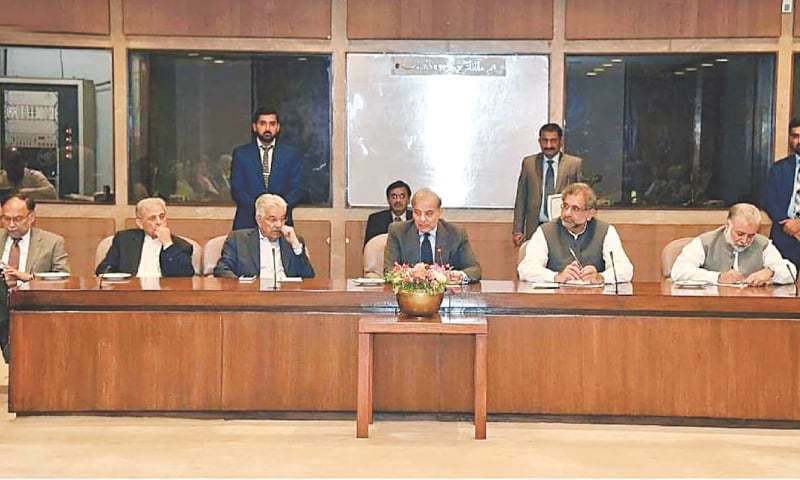 This was decided at the parliamentary party meeting held here at the National Assembly’s committee room with the party chief and leader of the opposition Shahbaz Sharif in the chair. Addressing the meeting, Mr Sharif briefed the participants on steps taken by the party for peace during the recent sit-in. He said the positive role of the opposition was an example for rulers. He said the opposition set aside past practices and played the role in the interest of the country and the nation. “Instead of adding fuel to the fire, we got our names written among those who poured water to extinguish the fire,” Mr Sharif said. He said the PTI had in the past cruelly used such opportunities for political mileage, but this time the opposition in general and the PML-N in particular avoided playing politics over the issue and set a positive precedence to follow in days ahead by working to maintain peace and keeping the national interest in view. He said the PML-N would play its due role in thwarting conspiracies being hatched against local bodies by the PTI government. It was decided that the situation would be monitored on a regular basis and appropriate steps would be taken accordingly. Mr Sharif directed the party’s lawmakers to actively participate in meetings of the parliamentary committee on rigging in the general elections 2018 and present facts and evidence about rigging before the panel. The parliamentary party meeting expressed concern over the grave economic crisis facing the country, saying there appeared to be no way out as the government lacked the economic vision and it had no strategy in place to cope with the situation. It was claimed that the economic instability and uncertainty was increasing with each passing day. The PML-N members said that the situation was not in the interest of the country and the nation and it could have serious repercussions for the national security. They expressed concern over increase in prices of petroleum products, after hike in gas and electricity tariff. They said the “tsunami of dearness” had made the life of common people difficult. They were of the view that economic, agricultural, commercial and industrial activities were gradually declining and warned that the trend could be a prelude to an economic accident. They said the hike, coupled with unemployment, was turning the situation from bad to worse. They were of the view that all these factors would adversely affect the GDP growth.